IBIX® lightweight, portable aluminum units are perfect for industrial plant maintenance in power plants, steel plants, manufacturing and heavy industry. 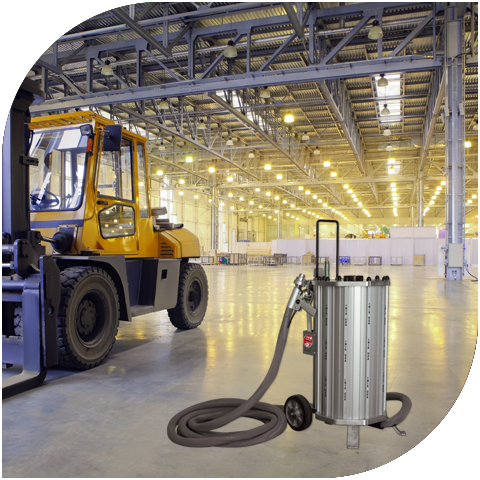 They are ideal for cleaning and removal of chemicals, paints and debris in harsh environments. IBIX powerful blast units are indispensable for corroded concrete factory flooring and virtually all types of pipelines and machinery. Effective on concrete, masonry, stone, steel, aluminum, stainless steel and composite materials. Our units are perfect for one-man operation, equipped with rollers for easy portability. IBIX units are user-friendly and deliver a precise, consistent even air and media flow for a smooth surface finish with very low air volume requirements. Minimal dusting improves health and safety for the operator and the environment. Unlike traditional coatings such as paint, our coatings are repairable. IBIX flame spray coating powder is a thermal Plastic Coating applied pneumatically. The raw materials, in a dry powder form, are propelled through a gun-type applicator and heated onto the surface. The material dries almost instantaneously and is more durable than any traditional coating materials. IBIX polymers and epoxies are engineered to work in conjunction with Spartacus flame coater, creating the most durable coatings imaginable even in the most aggressive, challenging locations.